Ukrainian President Petro Poroshenko hailed a sweeping victory for pro-Europe parties in an election Sunday (26 October), saying the vote showed people backed his plan to end a separatist conflict, his pro-Western policies, and democratic reforms. Poroshenko’s party was barely ahead of the party of his ally, Prime Minister Arseny Yatsenyuk, with both taking over 21% of the votes cast from a field of 29 competing parties, early figures from the vote count showed today. Addressing Ukrainians two hours after polling ended on Sunday night, Poroshenko thanked voters for backing a “democratic, reformist, pro-Ukrainian and pro-European majority”. “The majority of voters were in favour of the political forces that support the president’s peace plan and seek a political solution to the situation in the Donbass,” Poroshenko said, referring to the region of the industrialised east where government forces have been fighting separatist rebels. The result showed Poroshenko, a 49-year-old confectionery magnate, continuing to work in tandem with Yatsenyuk, with the latter possibly staying on as prime minister to handle sensitive talks with the West on aid for the war-shattered economy. With 18.50% of the vote counted, the central election commission gave the Poroshenko bloc 21.69% of the vote for party lists, while the People’s Front of Yatsenyuk, a hawk in his dealings with Russia, who is liked in the West for his commitment to deep reforms and stewardship of the economy, was at 21.63%. The figures, which roughly confirmed earlier exit polls, put another pro-Europe party from western Ukraine in third place. Poroshenko said People’s Front was the “main partner” in any parliamentary coalition and talks to form the majority could begin on Monday. He wanted talks to be wrapped up quickly to form Ukraine’s “best government”. But a surprise was the strong performance registered by allies of ousted president Viktor Yanukovich. The Opposition Bloc of ex-energy Minister Yuriy Boiko polled at 9.52%, enough to put the party into parliament, according to the early figures from the count. Though a fuller picture will not take shape for hours, it was clear a pro-Western assembly was emerging from the first parliamentary election since Yanukovich’s overthrow by street protests in February. The count gave a partial read-out only of party voting for 225 of the 450 seats in parliament. Results from voting for single constituency seats will be known in a few days time. The election completed attempts by Poroshenko and his allies to restore normalcy to the sprawling country of 46 million after a year of turmoil and violence. The overthrow of Yanukovich by Euromaidan street protests, which broke out when he ditched a deal to take Ukraine closer to Europe and out of the Russian orbit, led to Russia denouncing a “fascist” coup and annexing Crimea. Moscow went on to back separatist rebellions in Ukraine’s industrialised east, which have killed more than 3,700 people. Despite the surprise showing of Boiko’s Opposition Bloc, other traditional allies of Russia, such as the Communists, flopped, and the make-up of the future pro-Europe assembly seemed likely to spell future tensions with Moscow, with which Ukraine is also locked in a dispute over gas prices. It will be the first time the Communists have been out of parliament since Ukraine gained independence from the Soviet Union in 1991. “We can say today that a third of voters support the president’s course for carrying out reforms for entering the European Union,” said Yuriy Lutsenko, the leader of the Poroshenko Bloc. With the party of pro-Europe party Selfhelp in third place, at 10.30%, according to the early figures from the count, Poroshenko should be able to forge a coalition to move Ukraine towards the European mainstream. Other parties which seemed likely to enter parliament on the basis of the exit poll included the Radical Party of populist Oleh Lyashko. The Batkivshchyna (Fatherland) party of former prime minister Yulia Tymoshenko performed worse than many had expected, but with almost 6% from the partial count, was above the bar required to enter parliament. The outcome suggested many war veterans and Euromaidan activists enlisted as candidates will enter parliament, giving it a strong patriotic and nationalist tone. Boiko, whose party has criticised Poroshenko’s policies in the east, and campaigned in Yanukovich’s power bases there, said he would work for the “removal of the current authorities”. After battlefield losses, Poroshenko has said he would resolve the conflict in the east only by political negotiations. Voting did not take place on Sunday in areas held by the rebels or in Crimea. In eastern regions controlled by the army, armed soldiers guarded polling stations under Ukraine’s flag. “There was shelling all yesterday as we were preparing the voter lists,” said Nadezhda Danilchenko, a member of the election committee at a polling station in Volnovakha, a town about 50 km (30 miles) south of Donetsk in east Ukraine. Poroshenko went to a town in the Donetsk region held by the army, to show support for the troops in the east, where a truce is in force. There were no big attacks on election day. “The exit polls results allow making the first conclusions. Yesterday I asked you to vote for democratic, reformist, pro-Ukrainian and pro-European majority. Thank you for hearing and supporting this call! Constitutional majority – more than three quarters of voters powerfully and irreversibly supported the course towards Europe! The reload of state power is about to finish. Delay with reforms is fatal for us. Thus, I expect rapid formation of new coalition. I will not be a simple observer although this process is a duty of political parties and MPs. I will maximally accelerate this process that should end with the formation of a new Government and the adoption of the first package of reformist laws. My team has already drafted a detailed project of coalition agreement. It is not about posts. It is about principles and ideals, reforms and concrete laws. 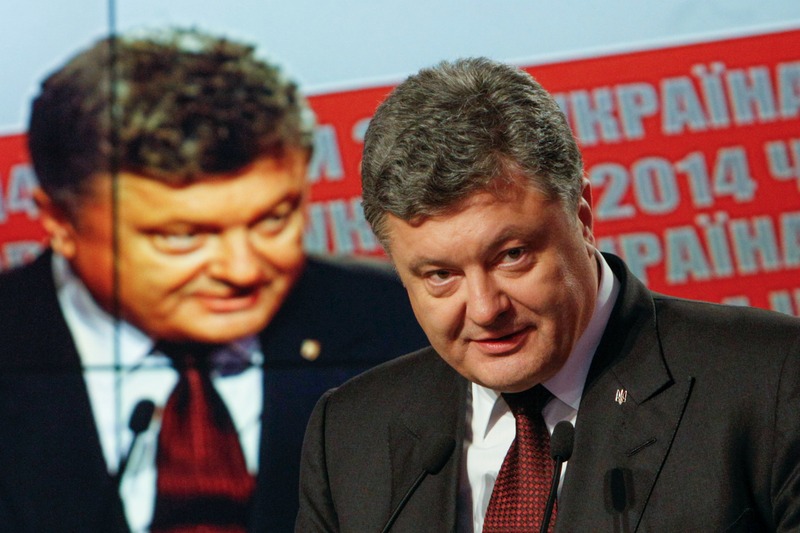 It is about changes for the best for everyone”, Poroshenko said. "I congratulate Ukrainian people for their courage and democratic resolve. The journey that started with the democratic resistance in Maidan and led to the regeneration of institutions with the election of a new President and Parliament is now complete. The most serious existential crisis in Ukrainian history has mobilised Ukrainians like never before, for the first time forging a real political nation and cementing Ukraine's European identity. Ukrainians can be proud of what they have achieved, of the freedom that they have regained through these orderly, fair and pluralist elections, as indicated by the electoral observation missions. They can now look at the future with renewed hope, expecting that their institutions will be accountable to them. In this spirit, the new Rada and government will now have the paramount challenge to work for a peaceful solution to the conflict, launch an economic rebirth with the help of Ukraine's partners, kick-start key reforms especially with regard to the rule of law, the judicial system and rooting out chronic corruption. The only regret from yesterday's elections is that Ukrainians in the rebel-held territories in the East of the country and in illegally annexed Crimea were not allowed to vote." The West adopted sanctions against Russia and Moscow retaliated by banning the import of Western food. A truce was declared on 5 September, but the situation on the ground has remained volatile. Leviy bereg, Ukraine: ????? ?????? ???????? ? ?? ????? ????????? ???????? ?????????? Zerkalo nedeli: ?????????? 21% ??????? : "???????? ?????" ? ???? ????????? ??????????? Pravda, Ukraine: ? ??????? ??????? ??????? ??? ???????????? ???????? ? ?????????? EURACTIV Turkey: Ukrayna'da seçimleri AB yanl?lar? kazand? EURACTIV Greece: ???? ?????????????? ???????? ???? ??????? ??? ???????? ?